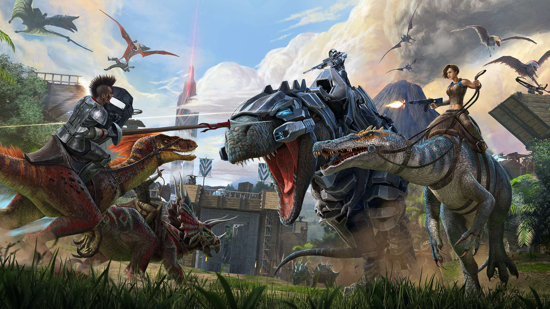 Studio Wildcard announced today that it will launch a new cluster of Official PvP servers for ARK: Survival Evolved! These ‘Conquest’ Servers offer Survivors the opportunity to play with up to 100 players per server and tribes will max out at 25 Survivors. Boosted 2X rates of taming, gathering, and experience assist ARK Survivors in focusing more time directly on battling other tribes! This batch of Conquest servers will provide that fertile ground for big tribes to come back and play! The Conquest Servers will be spun up and available for Steam players this Friday, September 28, and coming soon for Xbox One and PlayStation 4 players. Powered by Unreal Engine 4, ARK: Survival Evolved takes on the survival genre with a unique blend of emergent multiplayer cooperation and competition. Players awake stranded and starving on the beach of a mysterious island among a herd of other confused humans. In ARK, they must then hunt, harvest, craft, research technology, and build shelters to protect against scorching days, freezing nights, volatile weather systems, dangerous wildlife, and potential enemies. Tame, train, ride and breed one of 100 amazing dinosaurs and other prehistoric beasts, including gargantuan creatures on a scale never before seen in video games! Fly a Pteranodon squadron over the snow-capped mountains, race through the deep jungle with your pack of trained Raptors, tromp through a fortified enemy base along a convoy of gigantic Brontosaurus, or chase down prey on the back of a raging T-Rex.